The scientific community has definitively concluded that the quantity of carbon dioxide (CO2) in the atmosphere is higher than it has been at any time in the past 400,000 years. During previous ice ages, CO2 levels were around 200 parts per million (ppm), and during the warmer interglacial periods, they hovered around 280 ppm. 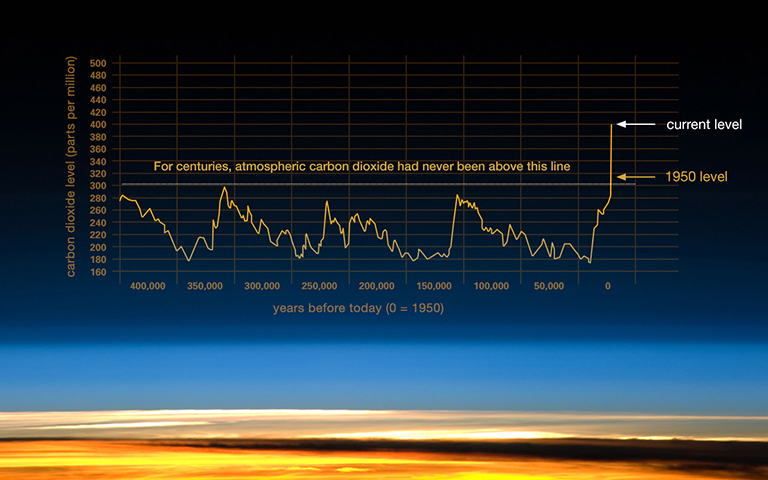 In 2013, CO2 levels exceeded 400 ppm for the first time in recorded history. This concerning rise in CO2 shows a direct correlation with the burning of fossil-fuel, 60 percent of which remains in the atmosphere, post combustion. If solar and wind capacity continues to grow at its current trajectory, it will not be enough to cap climate change below two degrees Celsius (3.6 degrees Fahrenheit), the target set down in the 2015 Paris climate treaty. The result will be an array of catastrophic impacts, from rising sea levels, mass species extinctions, increasingly destructive weather events, crop failures, and increased political instability. These impacts will disproportionally impact poorer nations, ill-equipped to manage the environmental and financial consequences that climate change will create. In addition to accelerating the deployment of renewable energy resources, and curtailing the use of fossil fuels, investment in and the deployment of negative emissions technology is the only viable pathway to avoid what the scientific community predicts will be irreversible and profound impacts to the global ecosystem. The movement of CO2 on the globe is demonstrated below in a unique video. To read the complete article that goes with this fascinating video, click here. It’s possible to literally put the carbon (CO2) back in the ground. It’s not complicated. 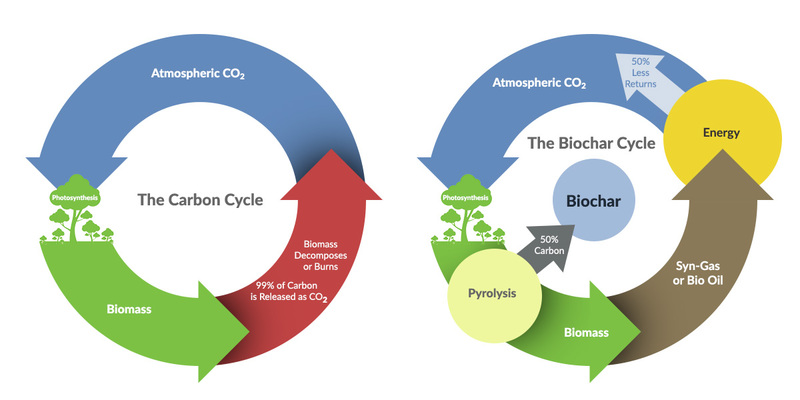 As a negative emissions technology, biochar production directly addresses climate change (also known the greenhouse-effect) by trapping carbon in a chemical (pyrolysis) process, thus reducing the amount of CO2 in the atmosphere. Furthermore, biochar addresses global food security challenges, desertification, and drought by reducing agricultural water requirements and improving soil productivity, particularly in damaged or contaminated soils. The NextChar technology stores three tons of CO2 permanently (thousands of years) for every five tons of dry biomass (wood, leaves, etc.) it processes. These metrics can be precisely measured and are generally accepted by the scientific community. Environmental advocates, from Bill McKibben to Al Gore, government agencies like the EPA, and DOE have espoused the incredible opportunity biochar offers to sequester greenhouse gasses, if a robust market can be developed to drive it’s large scale deployment.